Right now you can score a FREE Smart Sense Aerosol Air Freshener via Kmart's mobile app! Simply download the Kmart mobile app and tap on "Friday Fix" to access the coupon. This coupon is redeemed in-store and is valid through December 18th. 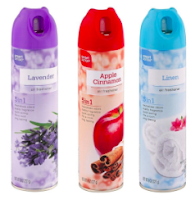 Simply have the cashier scan your barcode at checkout to score your FREE air freshener. This coupon must be loaded today.